1978 saw the release of the Coleco Telstar Gemini, which was totally different from any other Telstar pong system preceding it. Looking like a common pong, it doesn't play the common pong games. This unique system offered 2 shooting games along with 4 pinball games. This console featured 2 flipper buttons on either side which simulated playing a real pinball machine. There is also a big red button on top which was used to launch the ball in to the play field. The button simulated the real thing, a short tap will shoot the ball out slowly and a long press will shoot the ball out faster. 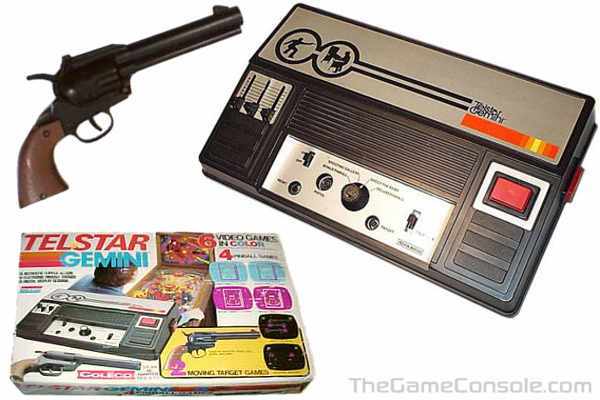 There were actually two completely different Coleco Gemini systems. The Telstar Gemini shown here is the older and rarer machine. The other is an Atari 2600 clone by Coleco called Gemini. Coleco probably did this to hide it from Atari's lawyer armada. This worked for a while, but soon after the launch of the console Atari unsuccessfully sued Coleco for braking copyright laws.